"All the Roberts Cousins," about 1915. Photo courtesy of Kelly Abner. It's possible that the six unidentified girls could be either nieces of George Roberts or Lucy and her sister Martha. Back row on the right is is Alice (Reeve) Robinson. 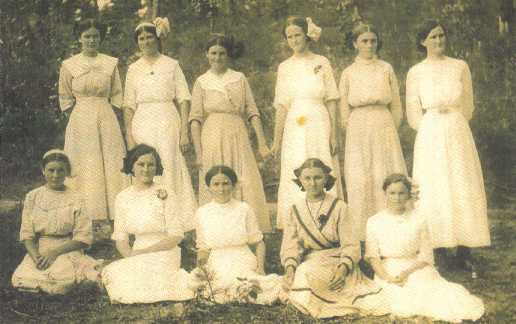 Front row, seated, left-right: possibly Ruby (Reeve) Abner; Ida (Reeve) White; possibly Eunice (Reeve) Bailey; Elna Roberts; and unknown. 2015 Update: This photo was taken at a McCullar reunion in 1912 according to the following link. The link was provided by Jennifer Comeens. http://freepages.genealogy.rootsweb.ancestry.com/~rogerhendrix/McCullar_Family_Reunion-1912.shtml.